Web app Lifetick offers a systematic way of making long-range goals--like taking a trip around the world, losing weight or running a marathon--a reality. But it doesn't pay enough attention to simple day-to-day tasks. Lifetick lets you set your core values in life, but not their relative importance. It offers a free account that supports up to four goals, and a paid personal account ($20 per year) with additional features. I've evaluated the free version. Lifetick starts you off on a gradual, structured approach. You must first set what Lifetick calls your "core values." These come before your long-term goals: they are what make you set those goals. For example, if one of your dreams is running a marathon, one of your core values probably has something to do with fitness or wellness. You can set up to 10 core values, although most people would probably not need so many. After considering your core values, it's time to set some goals. Each goal relates to a core value, and can have a priority (high, medium, low). 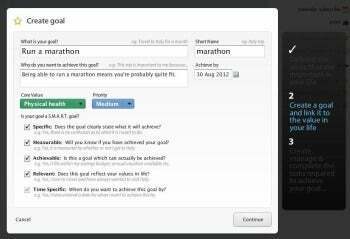 Lifetick also asks for a due date for the goal, as well as for your motivation (why you want to accomplish this goal). Finally, Lifetick asks if the goal is SMART -- specific, measurable, achievable, relevant, and time-specific. When creating a goal, Lifetick helps you relate it to your core values and ensure it is achievable. Like competitor Goalscape Desktop, Lifetick does well when it comes to the big picture, and makes it easy to see "the mountain," or where you're trying to go. But Lifetick doesn't stop there. Now that you have SMART goals stemming from your core values, the next step is to break them down into plans consisting of small doable steps and get to work. This is one area where Lifetick falls short. Its task management module is not as granular as I would expect. It does allow for recurring tasks, but it doesn't let you nest tasks to create hierarchies of related tasks within your goal. Having to transition from a large and lofty goal into a flat list of small individual steps is a big leap, and this can break the process. One of the most important things to do when working towards a large, distant goal, is to keep at it and do something every day or every week to get closer to that goal. To help you do that, Lifetick can email you. However those reminders don't have any motivating imagery or quotes, and therefore can easily end up being more nagging than helpful. 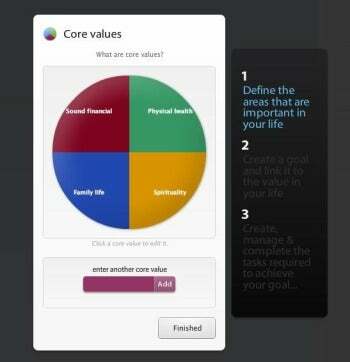 Lifetick includes a module for visualizing your goals and how they relate to your core values. Lifetick is a complete, highly integrated system that takes you down from your core values to your day-to-day activities, and allows you to align things so that your daily routine ends up getting you wherever it is you want to go in life. But in reality, most of us spend much more time doing simple daily tasks than we do pondering the greater picture or planning for the future . To be a viable day-to-day solution, Lifetick needs to get better with simple tasks. Ideally, it would work as a personal project management system, with task nesting and better keyboard shortcuts. Until that happens, Lifetick can be useful as a tool for thinking about your life, assessing your priorities, and figuring out where you want to go. Web app Lifetick is an online service that lets you define personal values and goals and then work toward them.